Summary: Superboy, who appears to be a teenage clone of Superman, fights crime in Metropolis. After accosting Lois Lane at the Daily Planet, he runs into aspiring reporter Tana Moon. Tana books an interview with Superboy on local network GBS. GBS, hoping to gain exclusive rights to Superboy, arranges for Superboy to apprehend crimelord Steel Hand in Suicide Slum. 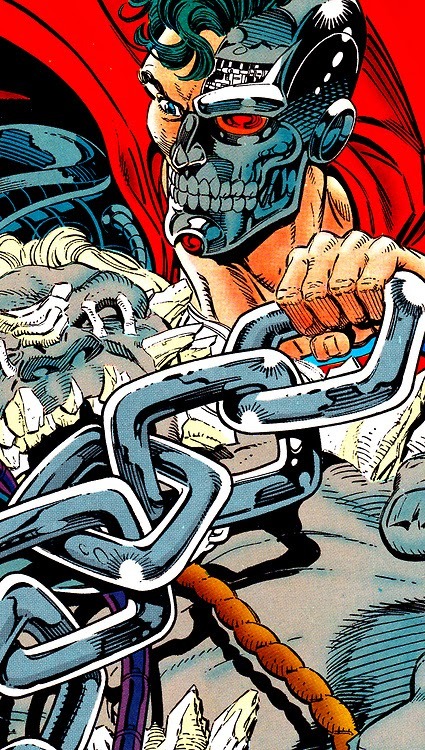 Unbeknownst to Superboy, Guardian helps him defeat Steel Hand’s gauntlet. Meanwhile, Bibbo rescues a drowning puppy and names him Krypton, and Lex Luthor interrogates Packard from Cadmus. Packard reveals that Superboy isn’t technically a clone. Irrelevant Continuity: At this point, Superboy wants to be referred to as Superman and is adamant that no one call him “Superboy.” Eventually, he’ll accept the moniker and star in his own spinoff. I Love the ‘90s: Superboy’s long on top, shaved at the bottom haircut was fairly popular in the early ‘90s. As a few people have noticed, Rob Liefeld had it at this time. Total N00B: Lex Luthor has mysteriously broken his leg since he previously appeared in Man of Steel #22. I don’t know which story the Return of Superman trade is missing. And exactly how many versions of Krypto existed in the post-Crisis universe? Review: Karl Kesel makes his full debut as writer of Adventures, which will now focus on the ‘90s incarnation of Superboy. I’m not certain how this happened, but the modern teenage version of Superboy has mutated over the years from a lighthearted, slightly bratty character into a po-faced, angst-ridden teen with issues. I’m not even sure if they’re supposed to be the same character, and how exactly Lex Luthor got involved in his (their?) origin, but I suspect it’s information I’d rather not know. I remember the new-new Superboy as the absolute worst aspect of the Young Justice cartoon, which summed up how far off the rails DC has gone over the years. They couldn’t even use the extroverted, upbeat Superboy in a cartoon aimed at kids. 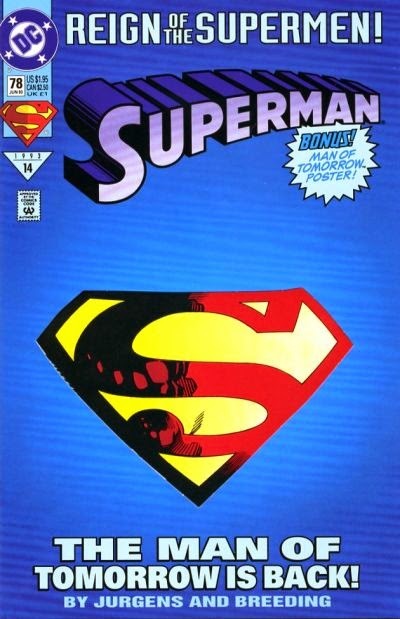 As he exists in 1993, the premise behind the new Superboy is that he wasn’t raised by the old-fashioned Kents and has come of age, with no guidance, in modern times. Even in the early ‘90s, that means he’s consumed with entertainment media and desperate to be famous. DC’s reluctant to outright label him a clone, presumably because they feel fans will think of him as a literal copy of Superman, so some mystery is thrown in early on to hint that there’s more to his origin than we realize. I personally feel “teenage clone of Superman” is a simple, easy to grasp concept, and think they probably should’ve stuck with it. Maybe they were trying to avoid the trap that Marvel soon fell into with Spider-Man, though. Superboy’s debut story establishes the kind of stories he’s going to star in for the next few years. He’s cocky, in over his head, but also has some measure of heroism inside him. I don’t think the Kesel/Grummett Superboy run ever quite reached the level of the Dixon/Grummett Robin era, but they’re all very entertaining teen superhero stories. Superboy seems heavily inspired by the Wayne’s World phenomenon -- not to the extent that he’s stealing the catchphrases, but it isn’t hard to imagine Adventures, and later Superboy, as the exploits of Wayne Campbell with superpowers. It’s the type of persona that could easily come across as a stereotype, or just outright annoying, but Kesel manages to make Superboy at the very least a readable protagonist. These stories are much less serious than the other Superman titles of the time, and if there must be a new Superboy, this is a fairly creative way to go about it. 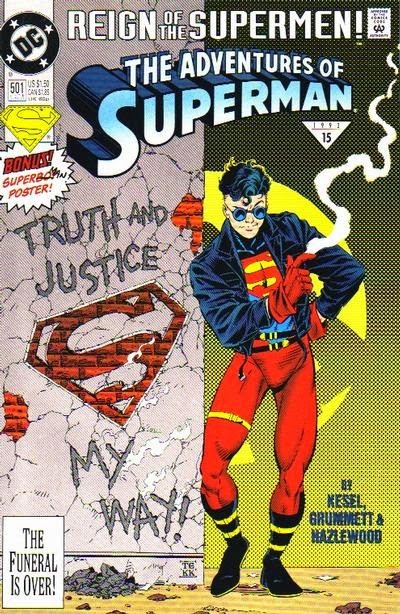 Teenage Superman with “attitude” just sounds awful on paper, but Kesel/Grummett are able to make it work. Summary: Cyborg Superman rescues a group of scientists at LexCorp from a nuclear accident before he begins his quest to find Doomsday’s body. 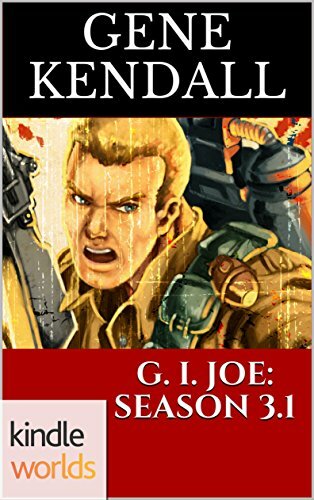 He battles Project: Cadmus’ guards and retrieves Doomsday from their underground lab. In orbit, he ties Doomsday to an asteroid and hurls him deep into the void of space. Back on Earth, Cyborg Superman meets Lois Lane and explains to her that most of his memories are gone. She takes him to Professor Hamilton, who confirms that his metal is Kryptonian and his DNA matches Superman’s. In deep space, Doomsday awakens and laughs. Irrelevant Continuity: Dr. Meyer from LexCorp met Superman back in Superman #51. Later, Professor Hamilton says that he has experience with Kryptonian technology because he examined “that Kryptonian artifact,” the Eradicator. Cyborg Superman doesn’t exhibit much of a personality at this point, but his single-minded determination to deal with Doomsday once and for all is a nice excuse for an action-heavy issue. Jurgens and Breeding do an excellent job with all of the big action pieces, creating very clean images that evoke a mix of classic John Byrne and the bombast of the more competent early Image material. I don’t think the design of Cyborg Superman has aged particularly well, but I think his look was always intentionally derivative anyway. If the kids wanted to see Superman as a cyborg because cyborgs were hot, there he is. He could’ve just as easily been Ninja Superman, but they went for Cyborg instead. Were this published a few years later, he’d probably be Mecha Superman. The design might seem dated now, but it doesn’t drag down the overall look of the issue. Superman always looks exceptionally polished under this creative team, so even when the lead character turns into a T2 riff, the book is still visually attractive. Summary: Henry Johnson entertains a group of kids with the story of John Henry. Nearby, the gang war between the Sharks and Dragons continues. One of the kids, Zoid, is killed in the crossfire. Henry tries to stop the killers’ car but is knocked against a wall. After recuperating, Henry designs a steel armor. Inspired by Superman, who once saved his life, he vows to clean up Metropolis. Agents of the White Rabbit, angry at his interference in the gang war, set his apartment building on fire. Henry uses his armor to rescue his psychic neighbor, Rosie. She speculates to the media that Superman’s spirit is in the Man of Steel’s body. Steel soon interrupts an arms deal between the gangs, but his potential informant Dutch is killed from afar by White Rabbit. Meanwhile, Lois runs into Jeb Friedman, as Lex Luthor contemplates recruiting Steel to his side. Steel won’t gain his true superhero name until later in the event. For now, he’s referred to as “Man of Steel.” Steel’s real name seems to have been retconned over the years. “John Henry Irons” is a nickname the local kids call him, while his real name is Henry Johnson. His online profiles today identify him as John Henry Irons, however. White Rabbit recognizes Henry inside the Steel armor. Henry is familiar with the “toastmasters,” which are high-tech, military weapons (Liefeld guns) that have somehow appeared on the black market. In the future, we’ll learn Henry’s connection to the weapons, and the White Rabbit. The debut issues of the four new Supermen must be happening simultaneously. Steel makes his public debut in the middle of this issue, even though Lex Luthor has already seen news reports of all four Supermen in the previous chapter in Action. Total N00B: I have no clue who Jeb Friedman is. He dresses like a cowboy and he’s already actively pursuing Lois just a few weeks after Clark’s apparent death. Review: Everyone seems to have accepted Steel as a character over the years, but I wonder how he would be received if he were created today. Would DC face criticism for having two white creators launch a new black hero from the inner city? Would we see editorials on the major comics sites, listing all of the minority creators who could’ve received the job? Is establishing Steel as an inner city hero fighting gang violence already too much of a stereotype? Would there be internet backlash for assigning Jon Bogdanove, the most cartoony of the Superman artists, to draw the black hero? These questions weren’t likely to be raised in 1993, or if they were, the internet (as we now know it) wasn’t around to give much of a voice to them. Yes, Steel is widely viewed as a positive role model now, but I would be curious to know if readers today would give him a chance before dismissing him as either a stereotype or a token. Reading his first full appearance today, it’s obvious that Steel is intended as the most likable of the new Supermen. The John Henry parallel is easy to make, and addressed in the very first pages, but Steel isn’t defined by the old folk tale. He helps local kids, he’s kind to his neighbors, and he’s an engineering genius, but he also has a secret from his past, one that’s driving him to make amends. Future issues will reveal Steel’s origin as a blend of Iron Man and the Prowler, which is a decent enough starting place as far as heroic motivations go. The visual of Steel is great, one I wish DC had never abandoned. 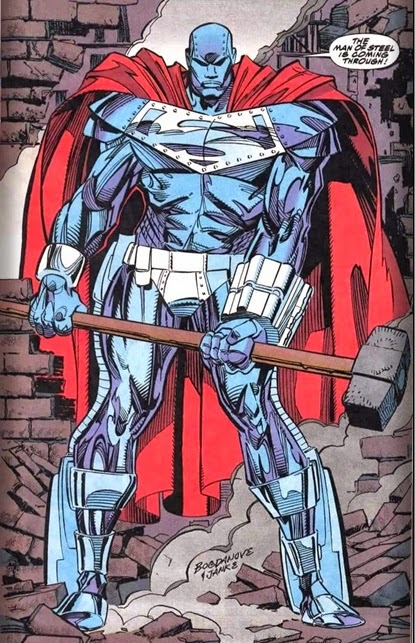 I love the giant hammer, and Bogdanove does a fantastic job incorporating Superman imagery into an armored suit. It’s a shame Shaq never got to wear the real Steel costume; I’m sure the Steel movie would’ve sucked anyway, but at least the trailers might’ve looked cool. 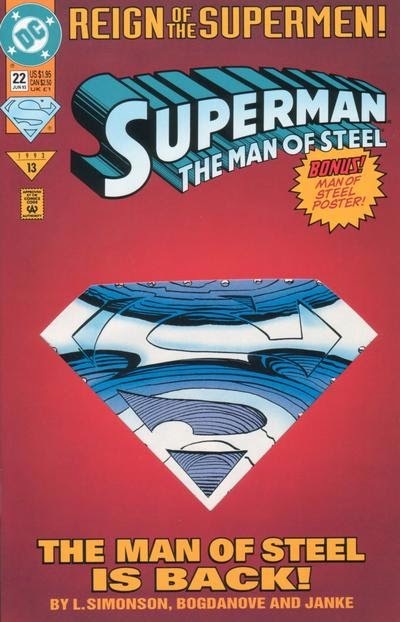 As for the larger event, the issue gives a somewhat half-hearted effort to sell the idea that Steel could be Superman reincarnated in another body. 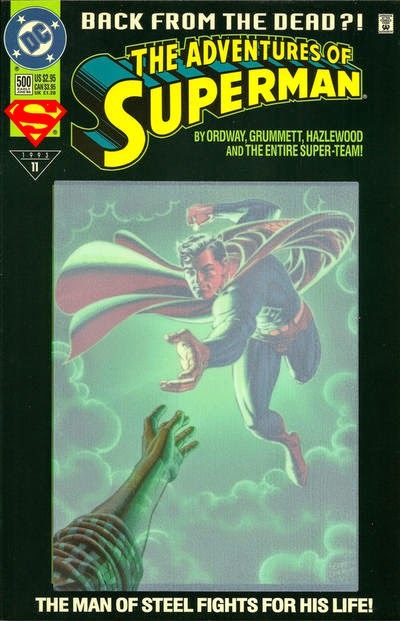 The premise is that Henry Johnson possibly died during the Doomsday rampage, and that his empty body became a receptacle for Superman’s soul after he was killed defeating Doomsday. The theory is advanced by a psychic already portrayed as a bit nutty, however she does seem to have some paranormal knowledge, so the theory isn’t totally discounted. I guess DC felt the need to at least open the door for Steel to be the real Superman, but it’s obvious that the true red herring in the titles is the Eradicator. The reincarnation bit feels like it’s tossed out there in order to fulfill some editorial mandate. The story would work better without it, to be honest. Summary: A being made of energy emerges inside the Fortress of Solitude. After learning of Superman’s death, he travels to Superman’s memorial in Metropolis. The being possesses the body, although his eyes are now sensitive to the sun. Donning a pair of sunglasses and a new costume made by the robots inside the Fortress of Solitude, he returns to Metropolis to fight crime as the new Superman. Lois Lane confronts him, and is shocked by his cold demeanor. The new Superman remembers Clark’s dual identity, but tells Lois that only Superman remains. Meanwhile, Bibbo decides to continue Superman’s legacy, while Supergirl questions why Lex hasn’t informed her of the new Superman. This new Superman, a.k.a. the "Last Son of Krypton," is later identified as the Eradicator. Aside from a lethal attitude, he possesses the ability to shoot energy beams from his hands. Lex mentions that four people dubbed “Superman” by the media have debuted in recent days. The continuity of where these stories are taking place in relation to one another becomes less clear in future chapters. Gimmicks: Every Superman title this month has a newsstand and a direct-only cover. The direct-only editions have die-cut, cardstock covers and it seems both versions have fold-out posters inside. Review: Well, I guess the mystery of which Superman is the real one is already resolved, right? This is clearly Superman -- he remembers the dual identity, his spirit has reemerged after “a battle” right inside the Fortress of Solitude, and he’s able to float right into Superman’s casket and take possession of the body. Yeah, he’s killing people left and right, but it’s the ‘90s and that’s what a hero has to do these days. His brain’s a little frazzled after the near-death experience, so he’s still figuring some things out; maybe he’ll stop frying people after he gets a better sense of his self, but it’s cool to see Superman act like the Punisher now, right? And thank God those awful undies on the outside are gone now! This is the Superman of the ‘90s, folks! Now, obviously, Roger Stern is doing all of this to make a point. Not every new Superman turns into a lecture on what Superman isn’t supposed to be, but using one of the titles to explore a fake Superman as the stereotypical Chromium Age vigilante is a legitimate choice in my eyes. One of the reasons why this storyline was approved in the first place was to make the audience of the time more appreciative of what makes Superman unique, so it’s easy to see what they’re going for. This is all rendered irrelevant in the days of the New 52 and Man of Steel, of course, but it’s a nice flashback to a time when DC was honestly protective of what Superman is supposed to represent. I do question giving Superman Cyclops glasses, though. If the goal is to make this Superman more stylized and (I’m assuming) Image-esque, I don’t see how those big dorky glasses are supposed to work. He should’ve had a cowl with Wolverine ears, of course. Summary: Jonathan Kent has a near-death experience in the hospital. He sees Superman walking towards the light and tries to talk him back. Jonathan pursues Superman and in the process, relives traumatic events from his own life. The entity Kismet sets Jonathan on the proper course, and he soon finds Superman in a Kryptonian funeral procession. When Jonathan tries to awaken Superman, the Krypotonians are revealed as demons. Jonathan and Superman escape into a tunnel. When Jonathan wakes in the hospital, he’s convinced his son is alive. On Lois’ plane ride home from Smallville, she sees a flying caped figure. Various news reports later claim Superman has returned. She visits Superman’s tomb with Henderson of the Metropolis police. They discover his casket is empty. Irrelevant Continuity: Subplots this issue include Vincent Edge sexually harassing Cat Grant (who doesn't seem terribly offended since she later accepts his dinner invitation), Jimmy Olsen avoiding the filming of his “Turtle Boy” TV show, the Prankster annoying his cellmate, and the Metropolis police attempting to arrest Gangbuster after he blows an undercover sting operation. A homeless man helps him get to safety. Also, Gangbuster has a warrant for his arrest because a group of drug dealers he previously busted filed charges against him. A footnote points to the Legacy of Superman one-shot. 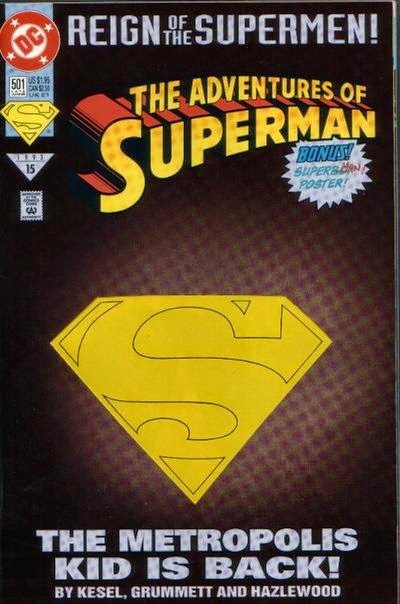 Production Notes: This issue was published after a two month gap in which the Superman titles suspended publication. 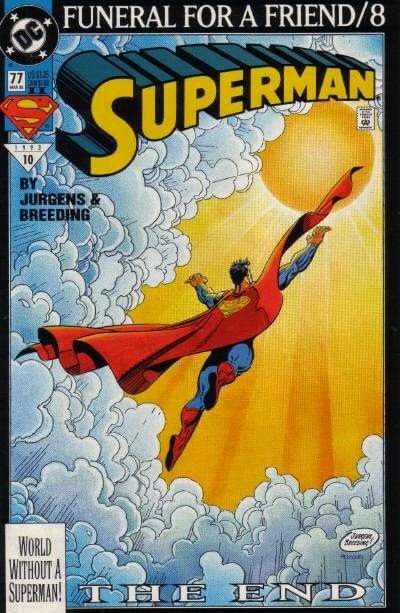 The World without a Superman trade only reprints the main story in Adventures #500. The next trade in the series, Return of Superman, reprints the final stories, which are all vignettes introducing the four new Supermen. Gimmicks: Three versions of this issue exist. A standard newsstand edition, and two collector’s editions, one in a white polybag and one in a black polybag. The collector’s editions have a holographic cover. According to comics.org, the newsstand version didn’t have eight story pages that were in the collector’s editions. The Fortress of Baileytude blog has a collection of the "deleted scenes." Review: Adventures #500 was the first big issue following the death of Superman, although apparently the sales didn’t live up to the hype. How do you follow up on the death of your most famous character? DC was stuck in an impossible position; this stunt was only supposed to be a temporary replacement storyline to delay Superman’s wedding, but now a large portion of the general public actually believed Superman was dead. DC rode the wave of controversy, embraced the publicity, and went out of its way to sell the death as being genuine, but how exactly could the creators get out of this hole? Feeding the hype only made Superman’s inevitable return a larger problem for the creators to handle. Adventures #500 is a logical choice to feature Superman’s return, since it is the next anniversary issue, but how exactly should Superman be revived? Bringing Superman back to the living and just returning to normal so soon after his death would be perceived as a cheap move. Maybe DC could’ve gotten away with that if only comics fans had been paying attention, but when you’ve made the New York Times and the CBS Evening News? Can you backtrack so quickly with the world watching? DC’s solution ultimately turns out to be this: hint that Superman’s alive, introduce a gimmicky storyline with four replacement Supermen, kill time, and finally, bring back Superman. It’s hard to imagine any scenario where Adventures #500 doesn’t disappoint some portion of the readership. Anyone who actually thought Superman was dead wouldn’t want to see him revived so quickly, and the readers who wanted him to return probably didn’t appreciate being teased in such a fashion. Luckily, hindsight makes it easier to simply judge the issue on its own merits. And it’s actually a strong anniversary issue. Jonathan Kent is the real star of the issue, with Ordway taking the reader on a tour of his life, reliving traumatic moments from his childhood on to his stint in Korea. I’m not familiar enough with Superman continuity to have a feel for how Jonathan Kent was normally portrayed in this era, but Ordway does a great job of making Jonathan fit the mold of what you’d expect Superman’s dad to be while also giving him a bit of a specific personality. He’s not just a generically nice old man, he’s a veteran who’s lived a hard life filled with loss. When Jonathan is pitted against Superman’s birth father in this ethereal recreation of Krypton, you’re genuinely rooting for Jonathan to win. There’s also a great idea about Superman accepting his “death” and entering the afterlife simply because he was taught by the Kents to believe in an afterlife. As a yellow sun charged Kryptonian, who’s to say his mortality is analogous to a human’s? Superman's been conditioned to believe he has to go into the white light, but how can be entirely certain that he's dead yet? As always, Tom Grummett’s contributions can’t be overlooked. Everyone’s on-model while being slightly stylized, the panel layouts are creative, and the action scenes look just as good as the conversation scenes. Doug Hazelwood also does an incredible job on the added tones during the afterlife scenes. I’m not sure if he’s using the same technique John Byrne used on Namor, but it’s a very similar look. I love the unique texture zip-a-tone provides, and it’s a shame that look has died out over the years. I have no idea if Photoshop can recreate it, but I wish someone would try. Summary: Steel emerges from the debris of Metropolis during a gang fight between the Sharks and Dragons. The Eradicator kills a carjacker. Superboy escapes Project: Cadmus with the help of the Newsboy Legion. Cyborg Superman flies into Metropolis and destroys a Superman memorial plaque in front of a family of tourists. Irrelevant Continuity: The back-ups in Adventures #500 introduce the four replacement Supermen. Since DC was unwilling to admit in the beginning that none of these characters actually is Superman, it takes a while for some of them to develop code names. For simplicity’s sake, I’ll be referring to them by the names they’re now associated with. Review: Overlooking the debate over whether or not transferring the titles to four fake Supermen was a good idea, I do think it was a pretty smart decision on DC’s part to give a teaser for each new character in Adventures #500. It makes the anniversary issue feel like an even bigger event, and of course, serves as a commercial for any curious fan about what’s happening in the rest of the line. In retrospect, it’s impressive that DC has continued the “event” sensation for so long after the start of the Doomsday storyline. Obviously there’s no way this issue was going to sell the same numbers as Superman #75, but I remember that a lot of enthusiasm remained for the books at this point. 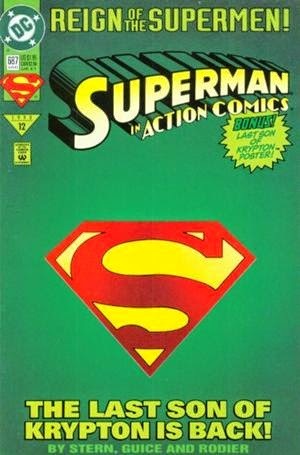 People who would never look at the Superman comics were openly debating over which Superman was the “real” one; a great hook for the next chapter of the story, even if the resolution is ultimately a copout. There isn’t a lot of story in the backups, just enough to give readers a sense of what to expect in each character’s respective title. Louise Simonson and Jon Bogdanove are going urban in Man of Steel, Roger Stern and Jackson Guice play off the ‘90s vigilante cliché in Action, Karl Kesel and Tom Grummett are exploring a lighter tone with Superman’s teenage clone in Adventures, and Dan Jurgens provides an ominous introduction for the Cyborg Superman that’s taking over Superman. It seems rather obvious that two of these characters are explicitly not Superman, regardless of what the pre-release hype might’ve lead us to believe. The two most likely candidates as the real Superman are given the most mysterious introductions, indicating that DC wants at least a few more months to string us along. That’s not necessarily a bad thing, if you’re not turned off by excessive hype and just willing to accept the “Reign of the Supermen” era as simply the next chapter of the story. 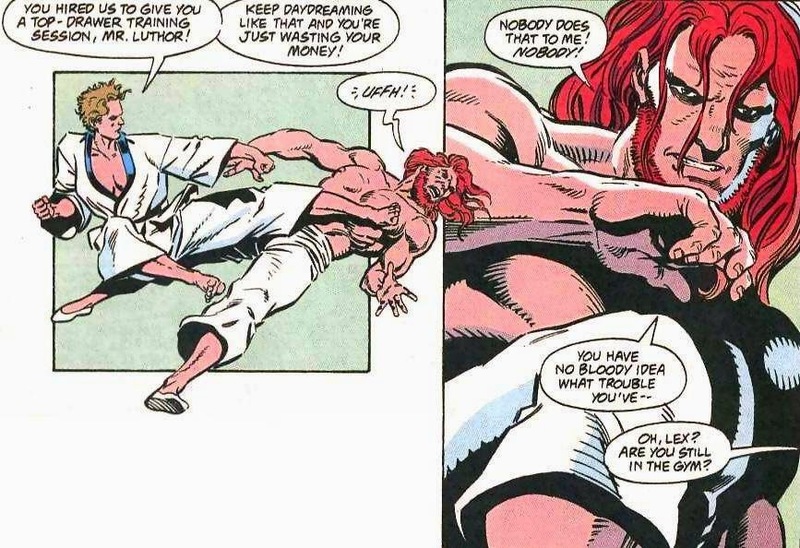 Summary: Lex Luthor spars with martial arts expert Sasha. After she embarrasses him during a match, she later disappears. Lois Lane informs Lex that Cadmus has stolen Superman’s corpse, information left out of her article. Lex sends Supergirl with her to recover the body. With the aid of the Outsiders, Lois and Supergirl invade Cadmus and retrieve Superman’s body. Lex helps them return the body to its tomb, and when he’s alone, boasts to Superman's body that he killed Sasha. Meanwhile, Jimmy Olsen’s death of Superman photo is chosen for a magazine cover, as Jonathan Kent flat-lines in Smallville. Irrelevant Continuity: Lex figured out Cadmus had stolen Superman’s body back in Action Comics #686. There’s no direct contradiction this issue, since Lex has no motivation to tell Lois he already knows, but it’s odd that he doesn’t hatch a plan until Lois brings it to his attention. Review: So, Lois makes her second trip to Cadmus in two issues and this time she succeeds in retrieving Superman’s body. At first glance, the body-snatching arc might come across as rather pointless, but I believe the Superman DNA samples taken by Cadmus during these issues will later be used in the new Superboy’s origin, so there is a sense that the creators actually have a plan. I much prefer the Cadmus action this issue to the previous chapter, if only because it’s handled by Dan Jurgens and Brett Breeding, artists who manage to make everything look clean and perfectly on-model. 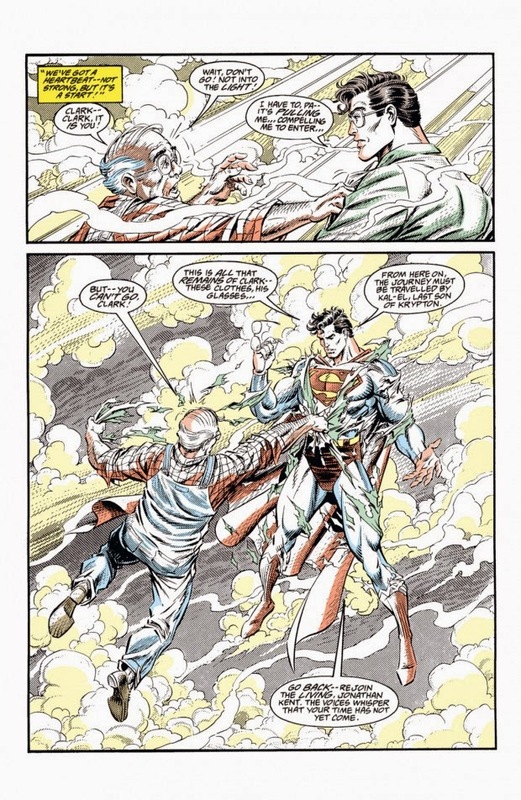 Jurgens also dramatizes Jonathan Kent’s heart attack in a creative fashion, intercutting the medical procedures with memories of his past with Clark. It’s touching without being hokey, and the choppy panel layouts are a nice contrast to the more straightforward action pages. The only real disappointment this issue would be the Sasha subplot. I get what Jurgens is going for, and that final moment when Lex boasts to Superman’s corpse that he’s killed someone and there’s nothing Superman can do about it now is a great scene, but Sasha’s death is a little too obvious. (Aside from the fact that it's ridiculous that Lex can get away with murder after murder and not get caught.) When she’s kidnapped by an off-panel hand midway through the issue, I just assumed that Lex Luthor was a red herring and that someone else would be revealed as the culprit. Of course Lex wants to kill this woman for embarrassing him, but it’s such an obvious move it's hard to believe some kind of twist wasn't coming. The Plot: Spider-Man searches the New York underground for Dr. Octopus and eventually finds a radiation trail. Venom meets him soon after, but both are taken captive by Dr. Octopus after they’re narrowly killed by Niner’s grenade launcher. Later, Dr. Octopus explains his plan to Spider-Man. After destabilizing national economies and devaluing established currencies, he’ll unleash neutron bombs to kill large portions of the population. Ock will rule a new science-based utopia. When Ock is distracted, Venom uses his symbiote to escape the cell he shares with Spider-Man. Dr. Octopus overtakes Venom, but Spider-Man ultimately defeats Ock. He soon realizes, however, that Dr. Octopus has already triggered a bomb in the city. Using Dr. Octopus’ computers, Spider-Man locates the bomb and disarms it. Venom disappears, after taking a printout of Dr. Octopus’ secret bomb locations throughout the country. The Subplots: The cartoon MJ worked on has its order cut after a weak debut. Doris calls with the good news that the cell phone company is dropping the charges, thanks to her investigation. I Love the ‘90s: The one bomb that Dr. Octopus does manage to trigger? It’s in the World Trade Center. Spider-Man finds it in a wine cellar underneath the Windows on the World restaurant. Review: Honestly, I wasn’t expecting this much of a happy ending. I was sure that MJ’s cartoon would be prematurely cancelled, but I just assumed that the Parkers would somehow get stuck with the $5,000 phone bill. Regardless, the personal life subplots have remained enjoyable throughout the novel, and I’m relieved to see Duane avoid any temptation to place MJ in personal danger during the climax. MJ isn’t totally divorced from the novel’s main story, but her role doesn’t feel particularly forced or distracting. Venom’s role, on the other hand, has becoming increasingly questionable as the trilogy has progressed. Looking back over the plot, it’s hard to see any significant role he’s played. Duane does use Eddie Brock’s past as an investigative reporter to her advantage, but any information he uncovers could’ve just as easily been discovered by Peter Parker with a Daily Bugle reporter. (Speaking of which, why does Mel Ahrens drop out of the story so early on?) Venom’s scenes aren’t necessarily bad, since Duane does have a handle on the character, and his final confrontation with Dr. Octopus is brief but fun. By the end of the novel, however, the reader isn’t left with the sense that he truly needed to be here. For commercial purposes, sure, although I wonder how much of a draw Venom remained by the time the trilogy completed. 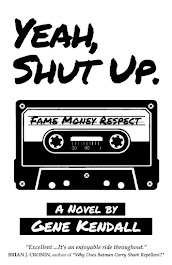 Ultimately, the novel is about society and its uncertain relationship with progress and technology. A twenty-something reporter eschews it, while a bored retiree embraces it and becomes a wealthy security expert. Dr. Octopus views mankind’s petty squabbles as an impediment to real progress, so he’s willing to destroy just what he needs in order to make his point and then start his own advanced civilization. Applying Ock’s intellect to money laundering, world economics, and sociology is a clever move on Duane’s part, and her choices for “ripped from the headlines” issues were clearly inspired. It’s a sharply written novel that never needed the Venom gimmick, I say. If you’re a fan of the characters or just suspense thrillers in general, it’s worth your attention. The Plot: Doris Smyth calls Peter to discuss the mobster’s cell phone. She tells him that it’s been wanted by several agencies for months and gives him a list of the numbers it’s dialed. Meanwhile, Venom investigates an import/export firm named Bothwell and learns that it has a connection not only to CCRC, but also to Dr. Octopus. That night, Venom enters the Parkers’ home. Convinced that MJ isn’t mob connected, Venom passes information to Spider-Man and asks him to contact the authorities. Later, Spider-Man meets with the AEC and is discreetly given two radiation sensors. At home, he studies the numbers called on the mobster’s phone and suddenly realizes that Hobgoblin’s underground hideout could’ve been provided by Dr. Octopus. He leaves a message for Venom and heads for the sewers. 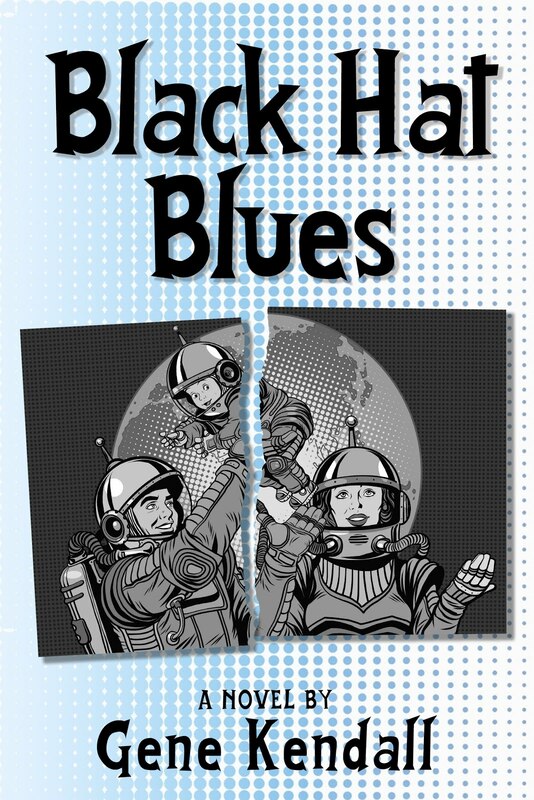 The Subplots: MJ meets Doris Smyth and drops off her personal phone that’s been cloned. She then travels to her second recording session, playing the role of supervillain Glaive. Web of Continuity: The Hobgoblin’s underground hideout previously appeared in the first novel in the trilogy, The Venom Factor. Peter assumes that Hobgoblin’s past as a mercenary means he could’ve been working for Doc Ock all along. Also, Venom's investigation into CCRC leads him to believe Doc Ock might actually be its owner. Peter wonders if it’s possible for the location of a cell phone to be tracked. Doris Smyth tells him its theoretically possible, assuming the phone has a certain microchip and you know its nearest cell tower. 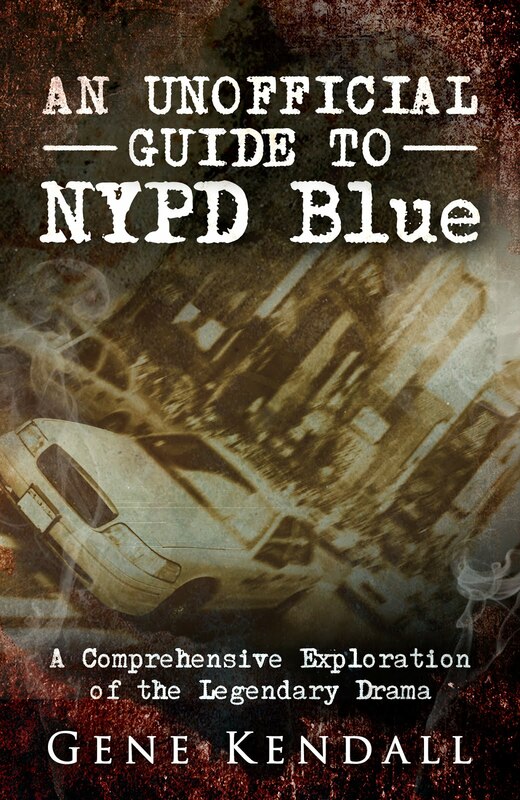 Review: Chapter Seven mainly consists of Peter receiving a lecture on the mechanics of cell phones and how the government can easily spy on them. Chapter Eight is mostly dedicated to Spider-Man learning about neutron bombs from an AEC agent. A comic couldn’t get away with two lengthy info dumps in a row, but in a novel, this is more forgivable. As usual, Duane’s research does a lot to enhance the story and draw the reader into the reality of the world, and the subject matter (government spying and terrorist plots to sneak small nukes into major cities) is of course prescient. While this section of the novel is light on action and heavy on pure technical information, Duane manages to add some character to the scenes. Doris, the eighty-year-old computer expert, is a fan of MJ’s old soap opera and is excited to meet her. Venom is allowed to do more than threaten to eat someone’s brain, when he's given an opportunity to show off his skills as an investigative reporter. And MJ draws upon an unexpected source to face her fear of Venom -- Glaive, the poorly-written supervillain she’s now playing in a cartoon. That last bit is perhaps too silly, but it does allow MJ to have a response to Venom that doesn’t repeat what we’ve seen before, while also not pushing her too far into the “warrior woman” cliché. She’s still terrified of Venom, but has a better handle on how to deal with the fear. The novel’s almost finished, and while the title villain has been noticeably absent for much of the story, I am curious to see how this plays out. And, honestly, a potential Venom/Dr. Octopus fight sounds like it could be entertaining. The Plot: Sgt. Drew arranges for Spider-Man’s “friend” Peter Parker to meet with Doris Smyth, a hi-tech security consultant. Peter gives Doris one of the cells he confiscated from the mob earlier to investigate. Elsewhere, Venom’s research into CCRC leads him to the shell company, Rothschilds Bank & Securities. Venom invades the offices and tortures one employee until he reveals the bank’s connection to the Russian mob. A mystery man named Niner escapes during Venom's attack. Venom takes five cell phones from the office and discovers one of their numbers belongs to MJ. Shortly after Spider-Man swings away from Doris’ apartment, he’s ambushed by Venom. Their fight ends when both are attacked by Russian mobsters. Venom spots Niner and leaves. Later, Niner meets with Dr. Octopus to discuss their money laundering scheme. The Subplots: MJ arrives at Sundog Productions and meets producer Jymn Magon. She auditions for voiceover work and is offered an interim role on a new superhero cartoon. MJ later returns home to discover Peter recovering from his fight with Venom. I Love the ‘90s: The phones Spider-Man took from the mob apparently don’t have caller ID, since he doesn’t know how to trace Galya Irnotsji’s number. Review: I was wondering how Diane Duane was going to bring MJ into the main plot this time. In the first novel, MJ gives up an acting job in order to be near Peter during the Hobgoblin’s nuclear scheme, and in the previous novel, MJ’s ongoing storyline was apparently going to tie in with the villainous plot at Cape Canaveral, although this turned out to be a red herring. This time, MJ’s the victim of (what I’m assuming used to be) a common crime. It’s a crime that also has ties to the Russian mob, the omnipresent CCRC, and Dr. Octopus. On top of that, Venom calls one of the mobster’s phones and gets MJ’s voicemail, so he’s jumped to the irrational conclusion that Spidey and his wife are mobbed up now. I’m undecided on where on the Scale of Coincidence Acceptability this falls. It’s not as egregious as the Shocker robbing a bank just as Aunt May enters, I will say. MJ isn’t the only victim of phone cloning, she’s one of thousands of people who have had their numbers hijacked, so that does help to prevent this from becoming a truly massive coincidence. Still, having MJ’s number be one of the five Venom discovers is a little too convenient. At any rate, Duane continues to write MJ incredibly well. MJ’s acting career is destined to stay on the B-list at best, so exploring the possibility of voice acting makes sense. It’s a way for her to keep acting as a career while also not gaining any real level of fame, which is where the writers always wanted to keep her. Having MJ work on a cheesy, ultra-PC superhero cartoon also adds some humor to the novel, and if you’ve ever watched the I Know that Voice documentary, then it should be obvious Duane’s done some research into how voice acting works. The main plot finally brings us the novel’s first Spider-Man/Venom confrontation. Duane handles the action well (there’s also a nice suspenseful scene featuring Spider-Man’s escape from a gunman that has him pinned behind a row of cars), and I’ll give her credit for remembering that Venom far outclasses Spider-Man. There is a sense of Spider-Man being in actual danger, and he isn’t able to escape the fight without a bruised, possibly broken, rib. And if you’re sick of Spider-Man/Venom fights, at least Spider-Man voices that frustration.